Landing Ship Tank (LST) 344, later named the USS Blanco County, earned her battle stars in some of the most important battles of the war. From Gela, Sicily, to Salerno, Italy to Omaha Beach in Normandy, LST 344 was a major player in the most significant actions in the European theater. LST 344 at Omaha Beach, Normandy France, 6 June 1944. LST 344 was one of the earliest of the LST-B series produced in WW2 and typifies the unheralded warships that were instrumental in landing American forces on enemy beachs. Ships like these provided the logisitical backbone to the American strategy to invade and liberate Europe. 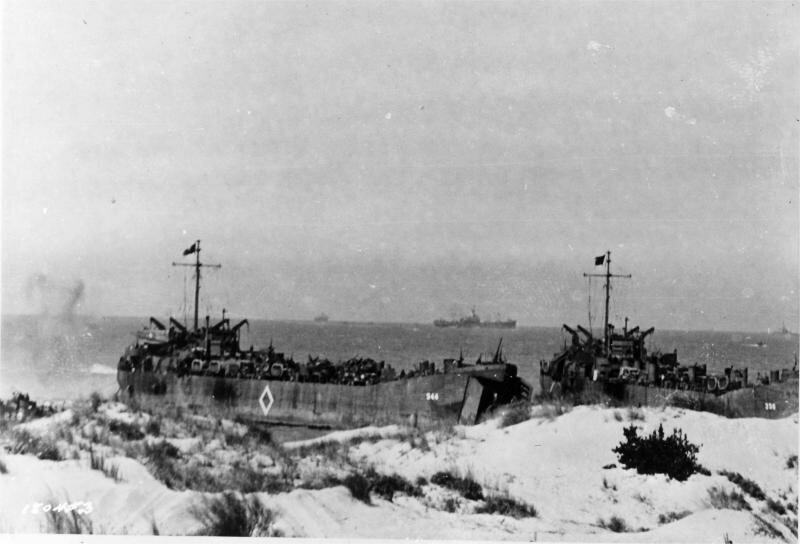 LSTs were essential in securing and maintaining Allied invasion sites. The ability to deliver tanks and heavy equipment directly to the beach is what gave the Allies the capability to conduct sustained operations in places of their chosing. 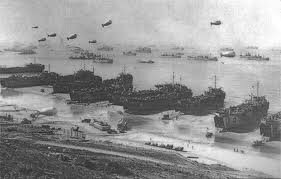 LSTs brought in the needed armor, troops, and supplies that were basic to the massive logistical operation of delivering and maintaining an invading army on enemy soil. LST 344 was battle tested in seas sewn with mines, bombarded by coastal artilleries and attacked by a variety of German aircraft. She shuttled back and forth from the invasion sites, delivering men and material...and then heading back to repeat the mssion. The value of LSTs was really demonstrated in France after the Normandy invasion. The Germans held most of the ports and those they lost were reduced to ruin before they gave them up. Sustaining the Allied armies required enormenous logistical support operations. Without port facilities those fiorces had be resupplied from the beachheads by ships like LST-344 that could deliver their cargo right on the beach,unload in a matter of hours and withdraw back to reload again. It was this sort of effort that allowed the Allies to keep the pressure the Germans in France until their defeat and then retreat back to Germany. LST 344 went into retirement after WW2, in Florida, but she was called back to active service in 1951 and she returned to the Mediteranean conducting logistical operation until 1956 when she was once again sent home, after being named the USS Blanco County. In 1966 the USS Blanco County was called up for one final campaign and after being refitted, set sail for Vietnam where she spent the next fours years shuttling around the Far East including one commendabe tour supporting Riverine Operations in the Mekong Delta. Like any old soldier she was finally retired in 1970 and decommissioned at Orange, Texas. 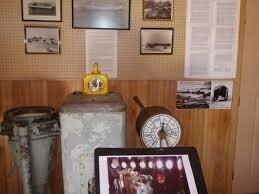 Prior to being sold for scrap, several components from her bridge made their way to Blanco County where they are now on display at the museum. LST 344 landing in Sicily on 10 July 1943. The USS Blanco County (LST-344) was an LST-1-class tank landing ship built for theUnited States Navy during World War II. Named for Blanco County, Texas, she was the only U.S. Naval vessel to bear the name. LST 344 conducted shakedown and amphibious training in Chesapeake Bay until early April 1943, then sailed in convoy on the 28th for the Mediterranean arriving in Algeria on 26 May. She then staged with Task Force 81 on her way to the Invasion of Siciliy. She arrived off Gela, Sicily around 0100hrs on the morning of 10 July and remained offshore until mid-morning. During that time, several German Messerschmitt Bf 109 fighter bombers tried unsuccessfully to skip bomb her. Several shore batteries also took her under fire wounding two soldiers but scored no direct hits. She completed unloading and remained offshore until 12 July when she headed for Tunisia to begin a series of reinforcement shuttles between North Africa and Sicily. The ship made five additional landings at Gela between 12 July and the first week in September. On 7 September LST-344 sailed from Tunisia for the invasion of Italy. She remained off shore from Salerno parrying sporadic German air attacks. On the 10th, she moved onto Red Beach and completed unloading in 90 minutes and made course back to Tunisia from where she made five more reinforcement voyages to Italy between mid-September and 19 October. She was frequently the target of German air attacks during these runs but sustained little damage. On 22 November LST 344 departed Algeria on her way to Great Britain arrived on 5 December and began preparations for the Normandy Invasion. For the next six months, she conducted amphibious training at various locations throughout the British Isles. She departed Southhampton during the late afternoon of 5 June 1944 and formed in convoy that night. On D-Day, 6 June, she disembarked troops and unloaded vehicles and equipment at Monaho Beach. Late that night, she started back to Southampton to pick up additional men and equipment. The ship went to general quarters at 2320 to ward off an attack by Junker Ju-88 bombers, and reported having helped to splash one of the attackers. The tank landing ship returned to Southampton safely on 7 June. For the next 10 months, LST-344 shuttled back and forth across the English Channel, first to the invasion beaches and, later, to the various French Channel ports after they had been captured and reopened. She departed France for the last time on 31 March 1945 entering port at Northfolk, Virginia on 31 May. She was then sent to New York for overhaul before returning to Norfolk on 28 August, a fortnight after Japan surendered. On 27 September, LST 344 headed south to Florida for inactivation and was placed in reserve until 1951 when she was recalled to active service again.